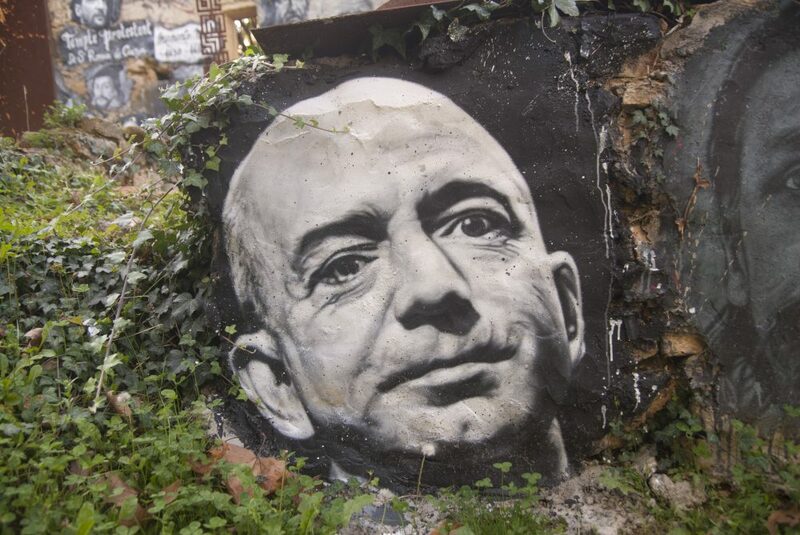 A spray painting by Thierry Ehrmann of Jeff Bezos on the Abode of Chaos in Saint-Romain-au-Mont-d'Or, France. Photo courtesy of Wikmedia Commons. Envious of Silicon Valley’s success, more than 80 places throughout the world have renamed one of their neighborhoods “Silicon-something,” including “Silicon Beach” in Los Angeles, “Silicon Bayou” in New Orleans, and “Silicon Roundabout” in London, as if the very word works an economic magic. So it was not surprising that when Amazon announced plans to build a second headquarters—“HQ2”—somewhere in North America, more than 200 cities decided to compete for the honor. Dangling the promise of 50,000 new jobs and $5 billion in investment, Amazon brazenly pitted state against state, and community against community, encouraging local leaders to trample over one another to offer Amazon billions of dollars in subsidies. There is nothing new about local governments providing “locational” incentives to private sector businesses in return for the promise of jobs and sizable investments in their economy. But the frenzy surrounding Amazon HQ2 and other such investments (remember Tesla’s Gigafactory?) seems to be reaching a new fevered pitch, as billions of dollars pass from the public to the private sector. And this in turn is raising old questions about whether such efforts on the part of local governments are efficient, ethical, or even effective. Regardless, cities from Boston to Nashville to Columbus, Ohio, took Amazon’s bait, with their staffs spending thousands of hours writing in-depth proposals. The most lucrative incentive package came from Newark, New Jersey, which in partnership with the State government offered the company a jaw-dropping $7 billion worth of incentives. Not to be outdone, the State of Maryland offered a package that may total as much as $8.5 billion. Despite the generous offers on the table, we wait still to find out which bachelorette will receive Amazon’s final rose. Is there a public benefit from lavishing billions of dollars on Amazon? First consider that, with or without incentives, Amazon will have to locate HQ2 somewhere, since the company can no longer contain its growth within the confines of Seattle. Incentives the company receives, therefore, simply represent a payment from local governments to one of the largest companies in the world for an action it will undertake anyway. From the perspective of the national economy, there seems to be little benefit to the HQ2 contest. Whether HQ2 goes to Austin, Texas, or Washington, D.C., the same number of jobs will be added to the national economy. But what about the benefit to the local economy that attracts Amazon? Adding 50,000 new jobs would help those parts of the country that have not been able to recover from the impact of a shrinking manufacturing sector. And the tech industry is a source of well-paying jobs, the growth of which should filter through to local public finances, such as higher property and sales tax revenues. Furthermore, Amazon’s arrival would create jobs in other sectors of the economy—what is referred to as the “multiplier effect”—as its workers spend their wages in supermarkets, restaurants, and dry cleaners. But at what cost? Public resources given to Amazon must come from somewhere. This means that taxes will be raised on other members of a community, or public spending must be cut in some other category. The reality is that resources that are provided to Amazon could otherwise be used on schools or infrastructure or law enforcement. Academic research suggests that, in the long run, incentives provided to a business can come at a significant cost if they starve a local economy of valuable public investment. Frequently the argument is that the increased economic activity brought about by an Amazon will pay for the subsidies provided, and then some. This is when multiplier analyses are typically rolled out—to claim that new private investment will create jobs and generate tax revenues for the local economy. While multiplier analyses have their uses, justifying government payouts is not one of them. This is because multiplier figures are based on the gross rather than the net impact—which is a fancy way of saying that these numbers assume that, but-for the investment of Amazon (or a sports stadium, or infrastructure, or event etc. ), land and workers would be idle, and not put to some other use. Of course this isn’t true, particularly not in today’s economy, with its near-record low unemployment rates. To fully consider the benefits received from attracting Amazon, a city must understand that, while adding jobs from Amazon would be a benefit, the costs extend beyond the payments they receive in return. A true accounting will consider that resources consumed by Amazon could have been used in some other way. This is particularly true for housing, which is a very scarce resource in major cities and especially in our home state of California. The rapid influx of tech jobs to an economy can be a mixed blessing: While tech growth can create jobs in local services sectors, it also can drive up the rents for the people who work in such industries—and displace people in nearby low-income communities. For this reason, affordable housing advocates have frequently protested against the further expansion of the tech sector in places like San Francisco (think protests against Google buses), L.A.’s Venice neighborhood, and Seattle. The reality is that resources that are provided to Amazon could otherwise be used on schools or infrastructure or law enforcement. Absent effective housing policy, these activists have a point. The jobs and wealth created by the tech industry increase demand for housing, and given local opposition to the construction of new housing, supply is unable to meet demand, placing upward pressure on house prices and rents. In the case of Los Angeles, the arrival of up to 50,000 well-paying jobs would place pressure on an already strained local housing market, laying bare the local failure to make housing more affordable for the majority of the community’s residents. Given the unclear benefits of pursuing HQ2, and the significant costs that winning the Amazon sweepstakes could create for local economies, why do local governments engage in such contests? Part of the answer lies in misguided views about how to develop a local economy. Politicians of all stripes are predisposed to pursue high-profile projects that make headlines—like attracting National Football League teams and creating expensive stadium facilities that employ people for a handful of days a year—instead of taking incremental steps that are more likely to produce economic gains. Instead of throwing millions (hundreds of millions? or billions?) of dollars at Amazon, a city like Los Angeles would be much better served by helping to develop the tech companies that are already here. For fast-growing companies like L.A.-based Snapchat, the city should be easing land-use regulations that stymie its growth and expansion. Also, there is a great and as yet unseized opportunity to develop links between the city’s entertainment industry and digital media companies like Facebook, Hulu, and Netflix. In this context, L.A.’s pursuit of Amazon is an unwelcome distraction. Research suggests that there are better—if less conspicuous—ways for local governments to improve their local economies—like worker training targeted to specific jobs, or extension services that help advise firms on how to reach new markets, improve productivity, and streamline production. In the long run, investment in needed infrastructure and local education would provide a bigger return to a local economy than Amazon. Unfortunately, this is not usually considered by the politicians and development professionals eager to catch the “big fish” to pad their own resumes, regardless of the actual value to the local citizens they are supposed to be supporting. Christopher Thornberg is Founding Partner of Beacon Economics and Director of the UC Riverside School of Business Center for Economic Forecasting and Development. Taner Osman is a Senior Research Associate at Beacon Economics and an Instructor in the Urban Planning Department at UCLA.